So far this month, we've seen a lot of fashion—and we mean a lot. If you’re feeling a little apprehensive when it comes to digesting everything from the runway to the streets, it’s more than okay. But for us to leave you in that place would be a crime. Instead, we're here to meet you in the middle and help you tackle the latest trending styles we saw all over fashion month, starting with street style. After sifting through hundreds of street style images from The Style Stalker, we narrowed down all the outfits to eight trends that were prevalent everywhere from New York to Paris. We are additionally well aware that street style tends to lean on the less-approachable side of the spectrum, which is why we shopped out a version of each trend you can wear in real life (or IRL, as the kids like to say). So if you're ready for some trend downloads and low-lift shopping, you're in the right place. Go on to read up on the latest 2019 street style trends and to shop the easy-to-wear versions of each. No matter the city, no matter the show, puffy headbands were pretty much always within an arm's reach. Of course, fan favorites were the Prada headbands, but we were certain we spotted a few Amazon versions as well. 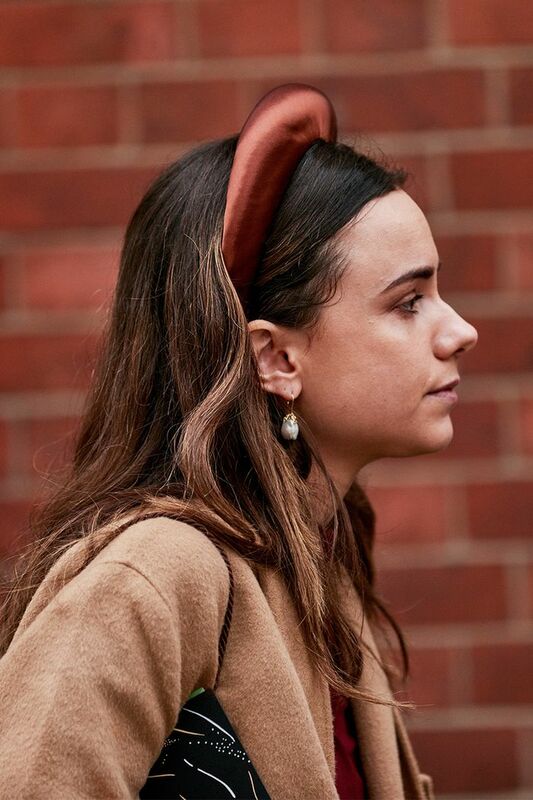 Styling Tip: Use this statement-making headband to add some life into a look you're already comfortable with like a Canadian tuxedo or jeans and a white tee. We really need to start assigning an animal per season. Last season it was leopard, and this season it was snake. From snakeskin boots to snakeskin trenches to snakeskin handbags, the street style scene basically looked like a Slytherin common room… in a good way. Styling Tip: Double up on your snakeskin pieces by way of a bold trench and either a handbag or shoes. Pair the pieces with dark denim and you'll have an easy-to-create look in no time. Suits have officially graduated from the trend rotation and into peak wardrobe staple status, but, of course, the street style scene had to take things to the next level by only opting for suits that looked like a color from the contents of a crayon box. From yellow to bubblegum pink, these brightly colored suits convinced us that this spring, color is definitely our friend… along with all beige, which we will get to in a moment. Styling Tip: Suits are pretty much a one-and-done sort of a situation. We recommend pairing your colored suit with white Western boots for a forward yet practical vibe. Yes, there are many aspects of fashion week that are glamorous, but there are also more moments filled with rain, snow, humidity, and frozen fingers to count. This season, attendees prioritized steering clear of rambunctious weather via weather-resistant everything including hats, jackets, and wellies. Styling Tip: The next time you're getting dressed for a rainy day, let your rain boots do all the talking by spotlighting them in your look. We love doing this via a printed dress topped with a raincoat, of course. Dressing in all neutral hues and crayon-approved colors is trending—keep up! Surely you've seen the #StickofButter hashtag all over Instagram which is fully building a community around dressing like food, and the street style scene followed suit. Not thanks to the whole butter thing, but because this is a trend we saw on the spring runways and the fall runways alike. Style Tip: Choose one neutral-colored piece and build upon it with other twinning hues, or combine different shades of the same beige family. Gird your loins, officially everyone is tucking their pants into their boots, no matter the height. Be it cowboy boots, ankle boots, or over-the-knee boots, word on the style street is that if you're wearing pants with those boots, they're better off tucked. Style Tip: Make voluminous pants feel more approachable by tucking them into a taller boot. This not only creates a fresh proportion within your look but it also takes away a little bit of the overwhelming volume from your pants. Statement coats amid the dead of winter? Groundbreaking. But in all seriousness, fuzzy colorful coats were everywhere this season allowing the wearers to be warm and stylish with ease. Apply that to your everyday life and you'll be serving looks that are equal parts practical and fun. Style Tip: Jazz up a more professional and polished look with a punchy outerwear piece. You're going to have to take it off at some point anyway. Layered leather looks graced everyone and everything from influencers to Instagram this season, and to be honest, we haven't seen the material styled in a way as fresh as this in a long time. Leather trench coats over leather pants and leather blazers over leather dresses made us wish the entirety of our closet was filled with nothing but a lot of buttery leather. Style Tip: When wearing multiple leather pieces at once, opt for two different shades such as light pink or camel. Next up, check out our official Spring Issue where you'll learn about trends, shopping, and more for the season ahead.